Last night we rigged and ran the insect light for the first time at Cape May Bird Observatory's Northwood Center. What we found throughout the night was nothing short of fascinating, but I'm going to focus on one species that caught my attention almost immediately after turning on the light. First, though, I need to back up a few years, to October of 2004. My wife and I had just moved to Somerset, New Jersey, to begin my PhD research at Rutgers University (she would decide to begin hers the following year). We had just become caretakers of Rutgers's Hutcheson Memorial Forest, a 560 acre research forest with a 64 acre old growth oak-hickory forest fragment. We were provided with a two bedroom house at reduced rent in exchange for caretaker duties including trail maintenance and providing guided tours of the property. It was a sweet deal, and a highlight of my graduate career for sure. I recall a large Ailanthus altissima, Tree of Heaven (Inga, my wife, would commonly refer to it as the Tree of Hell), on the main path through the old gowth section, which struck me because of its immense size. "That tree has been there since we began studying forest succession, at least back into the 50s and likely before" I remember being told by one of the retired professors who frequented the site. This noxious species, superficially similar to Black Walnut (Juglans nigra) but easily separated by the presence of leaf glands at the bases of its leaflets, was present throughout the site wherever disturbance had left an opening, ranging in age from this old vanguard to young seedlings no more than a year old. Within the same year I can also recall seeing what I mistook for Eastern Tent Caterpillars on a young Ailanthus. A mass of squirming caterpillars in a web fortress mounted between a skinny trunk and a lateral branch of a sapling only few feet tall. There it was; something that would eat Ailanthus! But why? where did it come from? this was a tropical species from Asia...how on earth could this be a host plant for a caterpillar in North America? I admit, I never pursued the question; just pondered it one day, and let it slip into the mental file drawer full of interesting questions that may or may not ever get answered. Until today. 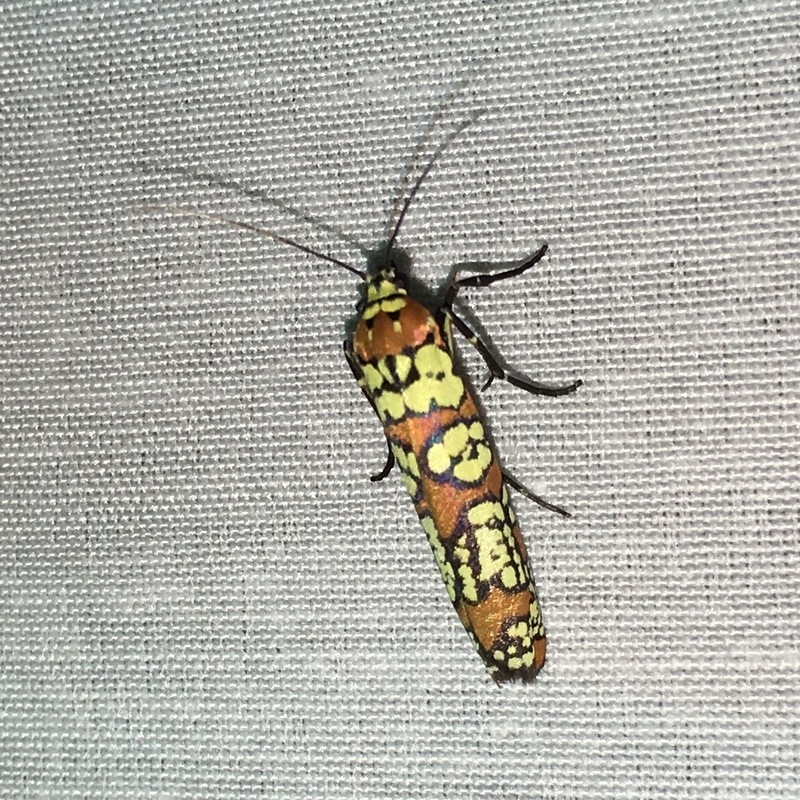 ...which turns out to be Atteva aurea, commonly referred to as the Ailanthus webworm moth. This is what those caterpillars I had seen over a decade ago metamorphose into; wow! It was gorgeous!! So with the name attached to the beast my mind raced back through my file of interesting-but-yet-to-be-pursued-questions, leading me to do some research on this little bugger. A 2009 paper titled A review of the New World Atteva Walker moths (Yponomeutidae, Attevinae) shed some light on the situation which I will share here (but you can read the entire article here if you'd like). Before I do, I just want to take a moment to note how exciting a time it is to be a naturalist. So many resources are now at our fingertips, and with a little training we can access more information than every before, almost instantaneously. 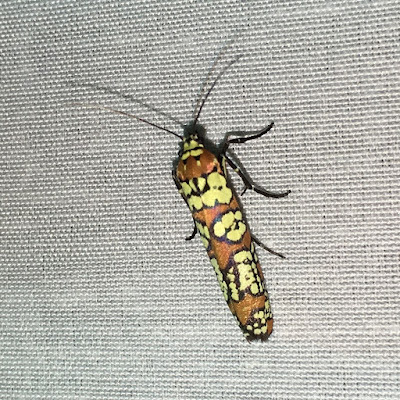 Identifying this bug was done using the iNaturalist app for the iPhone (there are also Desktop and Android versions), literally snapping a photo, uploading it, and checking it against computer-generated suggestions. The app immediately identified the species correctly! Finding the primary literature was done by simply searching the scientific name in Scholar.Google.com. Of course, if you are interested in learning more about this and all bugs, come out to the Northwood Center on Saturday night from 8:30pm - 10:00pm when we'll be running the insect light for the public to commemorate National Moth Week. More info can be found on our Facebook page: https://www.facebook.com/CMBObirds. The presence of aurea in the eastern United States and Canada and its association with Ailanthus altissima (Mill.) (Simaroubaceae) is an interesting subject to be investigated. This plant is an ornamental introduced from Asia and now considered one of the most serious weeds in the United States. It was first planted near the University of Pennsylvania, Philadelphia, in 1784 (W. Thomas, pers. comm.) and from there it spread over the entire country. Once it reached southern Texas, where presumably aurea was already present, the moth started to move north. By 1856 it had reached Georgia, as indicated by the material described by Fitch (1856: 486). Riley (1869: 151) found it common in Missouri, feeding on ailanthus. These records indicate that this showy and common moth was absent in the region before the introduction of ailanthus, and the approximately 70-year gap between the introduction of the host, to the first record of the moth by Fitch, is the time it took the plant to move south and the moth to move north. Apart from the hosp-plant records mentioned above, the larvae have been reared on the following Simaroubaceae: Castela peninsularis, C. polyandra and C. emory in the United States (Powell et al. 1973: 177), Simarouba amara in Costa Rica (Janzen, pers. com.) and S. glauca in México (by the present author). So there is is! The larvae can use other species in the same family as Ailanthus, and the spread of the moth is directly related to the spread of Ailanthus across the US and Canada...very cool! We will be hosting a special event at the Northwood Center in Cape May Point on July 29th, in celebration of National Moth Week - July 22-30, 2017. This is your chance to experience and learn about some of these beautiful and underappreciated creatures. We will have a sheet and buglight set up behind the center to see what we can find. The program will take place 8:30 - 10:00 PM, as sunset will be around 8:15. The Northwood Center is located at 701 East Lake Rd., Cape May Point. Hope you'll join us!! !